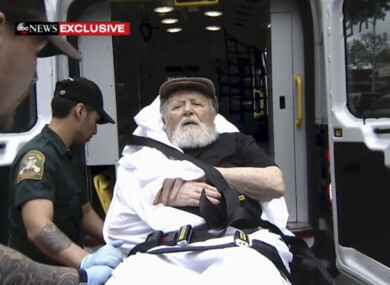 Jakiw Palij, a former Nazi concentration camp guard, is carried on a stretcher from his home into a waiting ambulance in the Queen, New York. GERMANY SAID IT has a “moral duty” to take in a 95-year-old former Nazi guard at who was was stripped of his US citizenship. The German foreign ministry said it had agreed to accept the former Ukraine national Jakiw Palij, following his expulsion from the United States on Monday, saying Berlin felt obliged to accept him in light of the Nazis’ crimes. “The United States had repeatedly pressed for Germany to take in Palij,” the ministry said of the former guard who worked at a camp where more than 6,000 people were killed. However, while Germany initially resisted moves to accept Palij because he was not a citizen, the foreign ministry said that those who served in the Nazi regime should not be able to live out their twilight years in peace in their country of choice. Palij concealed his Nazi past from immigration agents when he moved to the United States in 1949, the US Justice Department said. He became an American citizen in 1957. Efraim Zuroff, chief Nazi hunter at the Simon Wiesenthal Center in Jerusalem, praised the “perseverance and dedication” of US authorities in their efforts to have Palij removed. German media reports said Palij arrived at Düsseldorf airport on Tuesday and was to be taken to a care home. German prosecutors had opened a criminal investigation against Palij in 2015, but closed the case for lack of evidence. Although Germany has put several aged former Nazi guards on trial in recent years for crimes committed during the Holocaust, the head of the Central Office for Investigation of Nazi Crimes, Jens Rommel, told AFP it was unlikely he would be prosecuted. “Nothing has changed in terms of the evidence just because he has been transferred here,” he said. A federal judge revoked Pajil’s US citizenship in August 2003 and the following year, a US immigration judge ordered his deportation to Ukraine, Poland, Germany or any other country that would admit him. The last alleged Nazi war criminal deported by the US to Germany was John Demjanjuk, who served as a guard at the Sobibor extermination camp in occupied Poland, in 2009. A German court sentenced him to five years in prison in 2011. He died the next year. Email “Germany agrees to take in 95-year-old deported from US over previous life as Nazi guard”. Feedback on “Germany agrees to take in 95-year-old deported from US over previous life as Nazi guard”.